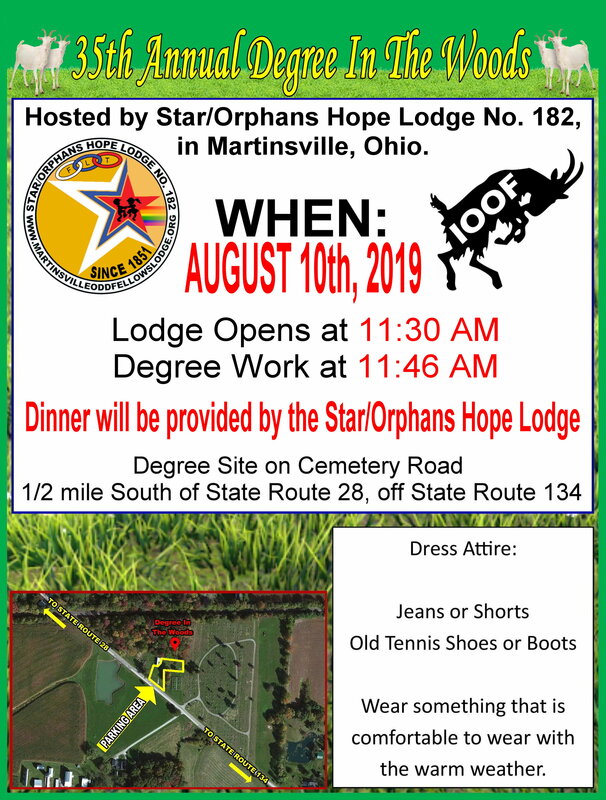 The following Degrees will be offered by the Star/Orphans Hope Lodge No. 182, IOOF, in Martinsville, Ohio. Initiation, First Degree, Second Degree, and Third Degree. TBA – 11:45 am - Degree in the Woods - Martinsville, Ohio - Location of the Meeting Place (Degree Site) is 479 Cemetery Road, Martinsville, Ohio. Cemetery Road is located ½ mile South of State Route 134. Lodge will open at 11:45 am with Degree Work beginning at 12:00(Noon). All four Degrees of the Odd Fellows will be conferred. As a custom, this class of candidates will be dedicated to our Grand Master TBA. There will be a dinner served which cost is $8.00. Please make a reservation with Eddie Smart, 7384 E. St .Rt. 28, Martinsville, OH. Email eddiesmart9@gmail.com or Phone 937-685-4825. Remember dinners will be served by reservation only as the meal is catered. Please have reservations in by Wednesday, TBA. Please have a letter requesting Degree Work and let’s have a big class of candidate’s for Grand Master Garwood Faunce. CLICK HERE to download the Degree In The Woods Flyer and Reservation Form.